Not my line so academic in some respects as I don't have full access. but I'm seeing 20k FECs/min ...with 8dB DS margin? I'm trying to work out, why this might be occuring besides the obvious "there's lots of errors on the line"
The best I've come up with, is that bins have been loaded where there is lots of noise, continually but this has been happening from the second showtime started. I do see a 2dB SHINE-style depression where the FECs go up to 40k/min too. HLOG is reasonable. QLN is a mess. General stats - 8/41/7500:900 interleaved; currently 32/4. I'm wondering if 64/4 would help too. a higher snrm would no doubt reduce the errors but would it stop them, my guess no. When I had a really high error rate adsl line I Could control my snrm with my router and I started playing around with it one day, even at 30db it had errors but were at a very low rate, that low rate turned to moderate at about 22db snrm, and anything in the mid teens or lower had a high rate of errors although not high enough to be service affecting. On my US on my new pair on FTTC, the errors are way better than my previous pair (about 10%), and it has a 12.4 db snrm and still got some crc errors but very low, only 13 in 31 hours. FEC is always higher than the equivalent CRC so if e.g. a fast path line with say 4000 CRC a day moves to interleaving, it wont get 4000 FEC a day it isnt one FEC to one CRC, the multiple is much higher, as I think when FEC makes a correction it does the entire block of data and the whole block is counted as FEC's. This is why people who might have noisy lines can see FEC in the millions as its an inflated figure. 20k a min is definitely high tho, a line where interleaving is probably saving him from a service affecting error rate. you got the stats for 15db? What were you after, specifically? The synch dropped to around 5500 I think. just the error count really. You know what the CRC's were at 8db? If they keep the line interleaved and the CRC rate was low then ultimately bumping it to 15db is pointless as FEC's dont cause any harm. But if your aim is to get it back to fast path then fair enough. You're probably right and that could do with reducing down to 9dB but I'm sure I subscribe to the whole 'FECs don't cause any harm'. I wonder how many FECs/min it would take to push the CPU to 100% load? Maybe it's an insignificant overhead? I would say insignificant, 40,000 a minute is nothing. Take a look at my works line on mydslwebstats. It pretty low at the moment around 120,000 but I've seen it hit over 600,000 per minute, and regularly in the 500,000 range. Our connection works fine, and has always been like it, but the level does seem to vary long term. Actually just looked at the graphs for the year, one point we was hitting over 1.2 million per minute. There shouldnt be any extra latency if FEC is high vs low as the latency is always on, from the interleaving, so a delay is added anyway to allow for the processing time, in theory high FEC may work the modem cpu harder but I dont think its anything significant. 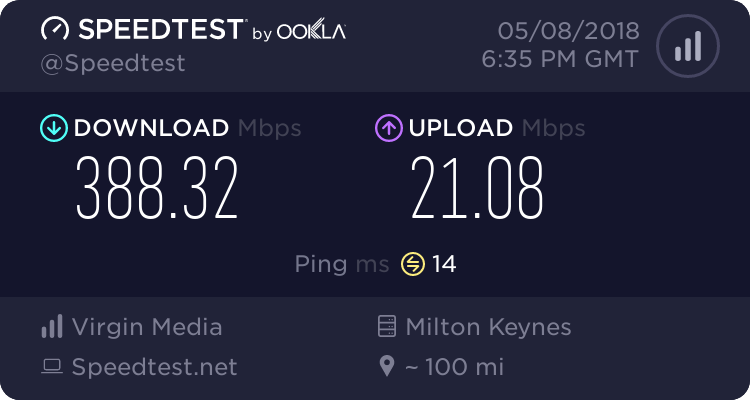 FEC can even work on fast path and I havent seen any noticeble latency from it (but to be fair my FEC has always been low on FTTC). Maybe someone with variable FEC can monitor latency and see if it spikes if a burst of FEC come in?